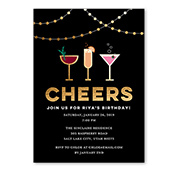 Get the party started with stylish, personalized invites in a range of designs. From second birthdays and sweet sixteens to 60th birthdays and 80th birthdays, there’s no reason to miss the chance to celebrate. We’ve got all your party planning needs covered for any style of celebration whether you’re looking for kids birthday ideas, 40th birthday party ideas or more. For every kind of birthday celebration, we offer invitations that come personalized with your photos, designs, greetings and more. 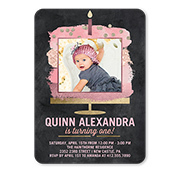 Choose from girl birthday invitations and boy birthday invitations for all ages, including baby, teen, and adult. While each and every birthday is certainly a cause for celebration, there are a few milestone ages where a proper birthday party is essential. More often than not, these milestone birthdays are filled with expectations for a big day that the birthday honoree has been looking forward to for a while now. Whether it’s time to celebrate a quinceanera, a 17th birthday, a 30th birthday or a 40th birthday, allow these extraordinary celebrations live up to their expectations with our articles filled with the perfect ideas and inspiration. Whether you’re planning a birthday party for your little one or having a party for adults, invitation etiquette is the same. Make sure you know what to put on your invitations and when to send them to everyone on your guest list. Another thing to remember is invitation information: date, time, guest of honor, anything the attendees should bring, dress code and the method for RSVPs. The general rule in timing is to send them out approximately eight weeks in advance, or a little less for a child’s party. 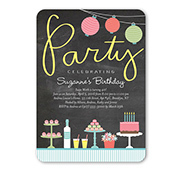 Before the big day, plan ahead and order your personalized thank you cards for after the party. 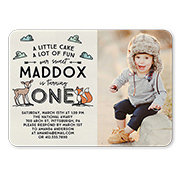 Shutterfly has a huge variety of many charming options, including designs that perfectly complement your invitations. With many modern and vibrant designs, there is something for everyone. No matter the age of the guest of honor or the party’s attendees, something fun to do is to place puzzles around the room for guests to enjoy; surprise them and create puzzles made from photos of your guests. Personalized photo puzzles are easy to make and always fun to solve. Another fun option that is great for a kid’s birthday or even as a party favor is a set of customizable plates from Shutterfly. Our top-quality plates are the perfect memento that your guests are sure to cherish for years to come.